Dona Nobis Pacem is now up on the Chubby Sparrow site, you can download and listen to it here. Along with Ode to Joy (below), we’ll be playing this at the Peterborough-Kawarthas harp circle in honour of Peace Day on Sept. 11th. For those who can’t make it, we’ll be playing with you in spirit! All music in the Chubby Sparrow free music section is available for anyone to download and use free of charge. We just ask that you include all headers and footers in your print copies. Everyone is welcome to download the music and play with us in spirit, even if you won’t be able to attend the Peterborough-Kawarthas harp circle in person. I would just ask that you include all acknowledgements, headers and footers in the print-outs. Music for Dona Nobis Pacem to follow shortly. This is the first of a new series of Harp-Related Q&A , to celebrate the Harp Blog being back in action (hooray! ), and in honour of the first Peterborough-Kawarthas harp circle in over a year (!). A sample of a tune arranged for multiple harps can be found by following the link at the bottom of the post. A Harp Circle is an informal gathering of harpists (or harpers, if you prefer), which can take many forms. The one thing they all have in common is the sharing of music. A typical harp circle might start with a general meet-and-greet (which often involves people trying out each other’s harps), and everyone making sure their harps are tuned. Bringing an electronic tuner is wise for this part, since there will be a lot of background noise (this is where tuning pickups really earn their keep! ), and everyone will want to be at the same pitch (A=440, or concert pitch, is standard in most areas). This is often followed by learning one or more group pieces. Usually the group leader or organizer will have copies available for everyone, with parts at varying levels of difficulty (easy parts for beginners, more challenging parts for the more experienced). Sometimes this group participation might take the form of a more formalized workshop, with a specific topic, such as singing with the harp, Welsh tunes, improvising, Irish ornaments, and so on. However, in some cases it can be as casual as someone handing around some sheet music and saying, let’s all try this one! Either way, the group organizer will let you know what format the circle will take. At the mid-point will be a welcome break for munchies and socializing (participants are often encouraged to bring contributions of snacks, although sometimes these are provided by the host). After the break, there may be more group playing, or the second half of the workshop, but often this is the stage for the “once-around-the-circle”, where people are free to play a piece of their choosing. This can be a great opportunity for shy and inexperienced players to try something out in public for the first time, in front of a small and sympathetic audience. It can also be a chance for more experienced players to try out something new, or play their latest “party piece” – essentially, show off their playing prowess. It certainly never hurts to get a healthy boost to the old self esteem, in the comforting company of peers! However, all players will be encouraged to pick something relatively short, so everyone who wants to has a chance to play. The performance part, in almost all cases, is strictly voluntary. The idea of harp circles is to have fun, in a relaxed, no-pressure environment. Players can feel free to participate as much or as little as they like. For the complete beginner, sometimes it’s great to just be able to meet other harpers and see different harps, even if you’re a bit too shy to try playing along the first time. In honour of our first harp circle of 2011, I’ve whipped up an arrangement of Southwind for multiple harps. You can follow the link here to download both a print copy and midi file version from Chubby Sparrow. Feel free to add your comments or questions below. Childgrove can be played as an upbeat dance tune, or at a slower, more thoughtful pace. The arrangement I wrote for our trio includes a counter-melody based on “The Foggy Dew”, and is played at a medium march tempo, whereas English Country Dancers generally like it played at a fair clip. The C# in bars 24 and 32 is optional; it can be played as a modal tune without lever flips. (I’ve included both versions in midi form on the Chubby Sparrow Site here). The HarpBlog Tune of the Month is courtesy of Chubby Sparrow Music . For a printable version, right click on the picture and choose “save target as”, or pop over to the Chubby Sparrow Free Music page for more detailed printing instructions (note: if you just left click and try to print directly from the browser, it probably won’t print at the right size). This upbeat tune is popular at the Celtic sessions in our area. It lies fairly easily under the fingers for harp (especially the B part), so with practice you should be able to play it at a decent clip. Click here to listen (right click to download the midi file). We often play Cliffs of Moher in a set with Tenpenny Bit. Portsmouth is a popular English Country Dance tune. This version is in G major. Goes well with Knole Park and All in a Garden Green. 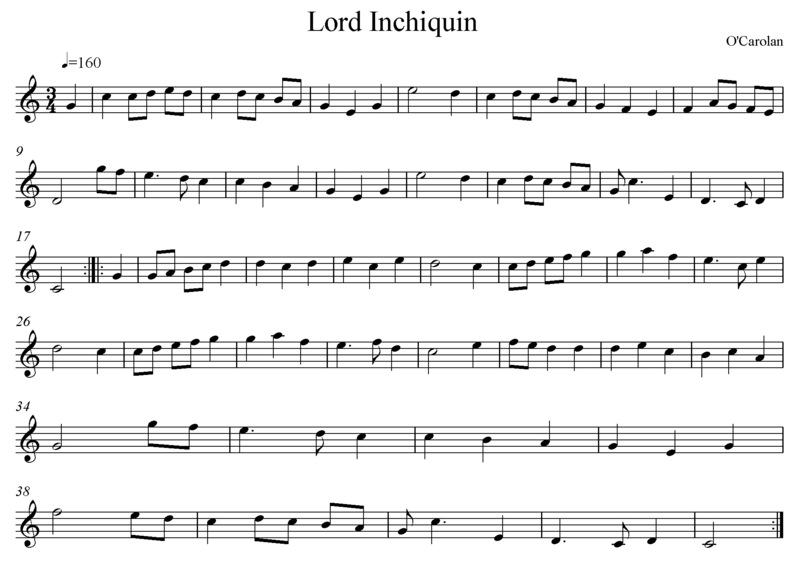 To hear a midi version of this tune, click here. An upbeat 14th C. song by French composer Guillaume de Machaut, Douce Dame Jolie is quite easy to play on the harp. A simple rhythmic drone using open fifths is all you need for accompaniment. More info on this piece can be found here. 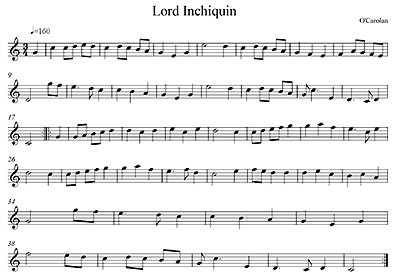 To hear a midi version of this tune, click here. Apologies for the infrequent posting; I’m caught up in April Fools (another monthly writing challenge, to help spur on the finishing of the first draft of my novel), and in the madness my websites are feeling a wee bit neglected. Here’s a cheerful tune for April, by the famous Irish composer and harper, Turlough O’Carolan. (Although it’s hard to believe it’s spring today – here in southern Ontario it’s been quite wintery for five days now, below zero and snowing!). Drowsy Maggie is an example of the type of quick reel that is often played in sessions. We usually do this in a set with several other E minor reels. The chords are fairly simple, mostly alternating between Em and D in the A part; and D, A and G in the B part. Once again it’s properly winter here in the PeterPatch, with snow swirling merrily about outside. The snow first arrived on Tuesday. Concerned that it might just up and melt away the way it has every other time this year (it had been a disturbingly warm and wet winter up to that point), M. and I decided to take advantage of the stuff and dig out our snowshoes. So the past few days have seen us tromping through the snow, and coming home cold but happy to cups of hot chocolate. The cats, of course, are deciding that this is the perfect time to curl up under warm blankets. What has this to do with harps, you ask? Not much, I admit. Except that since this is a very quiet time of year as far as harp gigs are concerned, I’m able to dedicate more time to working on the update of the Chubby Sparrow Site, and to playing with Sibelius. 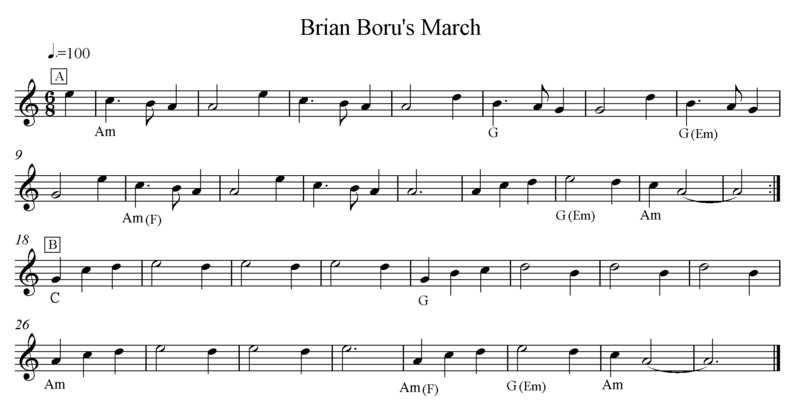 January’s tune is Brian Boru’s March, because – well, because I just couldn’t avoid it any longer. This is one of the very first tunes I learned on harp, and one that I teach to many beginners. 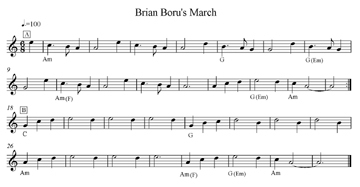 It’s easy to pick up because of its repetitive patterns, and it’s a cheerful little upbeat march that works well on just about any instrument. Enjoy!